“I’m not a follower of the vegan lifestyle in any way, but after taking a bite of Chef Tanya’s Kitchen’s “El Cubano” sandwich, I almost converted. At Chef Tanya’s the ham for the Cubano is substituted with seitan -- a wheat protein that, marinated the “Tanya way,” provides an exquisite alternative. For owner Tanya Petrovna, the eatery represents a return to the Coachella Valley food scene after founding, and later leaving, Native Foods Cafe. "This plant-based take-away spot is in an inconspicuous location in an industrial area, but this does not stop it from having a continuous line during lunch hour. This place will have vegans and non-vegans alike raving about every single bite." "If you want to learn just how mainstream a meatless diet has come, ask longtime Palm Springs resident Tanya Petrovna. When she opened her first vegetarian restaurant in town back in 1990, she didn’t even include the word 'vegetarian' in the name for fear of scaring off potential customers. She later founded the vegan chain Native Foods and, more recently, opened the doors to her plant-based paradise known as Chef Tanya’s Kitchen. The counter-service spot hidden within an industrial neighborhood started as a deli with little seating but has morphed into a lunchtime gathering spot. 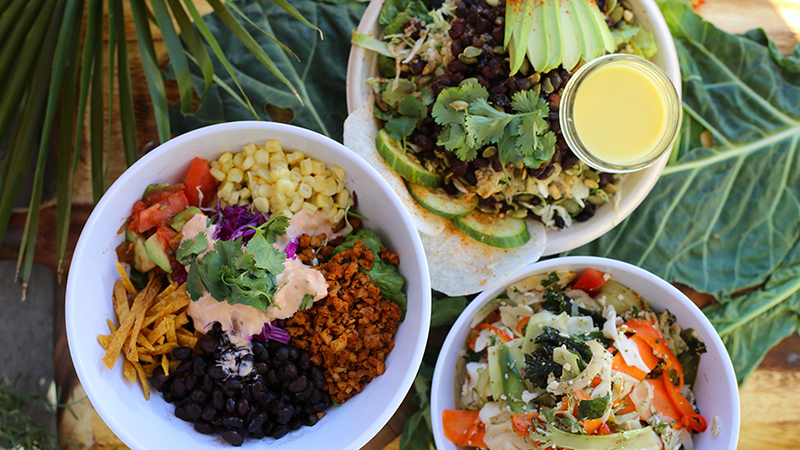 Tanya’s fabled housemade seitan is the base for hearty sandwiches, and there are lots of colorful salads, daily specials including tacos on Tuesdays, rotating soups, and ever-changing agua frescas. You can also grab deli salads like Moroccan-roasted cauliflower or eggless egg salad to go along with jars of her addictive cashew-based crack cheese." "Chef Tanya Petrovna has one mission: to make vegan food taste good." Check out the video above to hear more from Petrovna about her approach to vegan food, sourcing ingredients and more. "We love the Chupacabra Chicken sandwich (thinly sliced seitan filets, avocado, cilantro, house-pickled jalapenos, lettuce, roasted tomato, onion, chipotle mayo on a torpedo roll), or try one of the many deli salads, like the Moroccan Chop (local sweet potatoes, cauliflower, chick peas, parsley, red onion, Moroccan vinaigrette, currants, almonds, Flying Disc dates, green olives)."